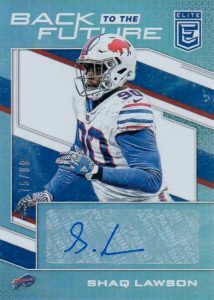 The 2017 Donruss Elite Football checklist offers the earliest chance to obtain on-card autographs for rookies in their NFL jerseys. Collectors can find at least one hard-signed rookie autograph along with a second signed card, and a memorabilia card, in each hobby box. 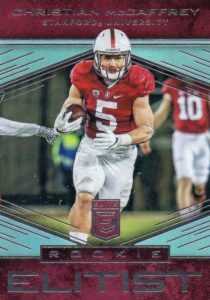 This release largely mirrors the 2016 set in overall look and hobby box format. 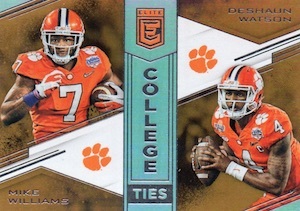 A similar set with a NCAA focus came earlier in the collecting season—2017 Panini Elite Draft Football. 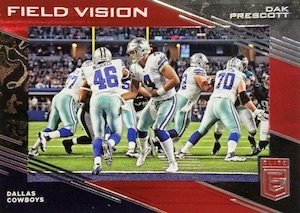 Again displaying a segmented primary design, the base set features key Rookies, numbered to 499, and incorporates hobby-only Status Die-Cut parallels along with Rookies Aspirations. 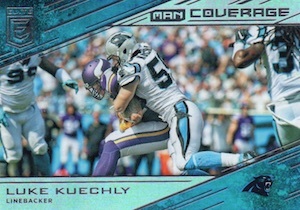 Additional parallels bring the rarity down to one-of-one editions. 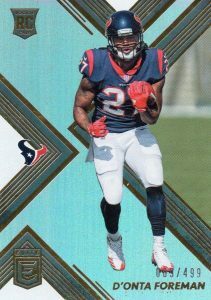 Inserts also feature heavily in 2017 Donruss Elite Football with Face to Face, Family Ties, Field Vision, Fired Up and Spellbound sets. For many, the main appeal stems from the hard-signed rookie cards found in the well-known Pen Pals insert, which come in every hobby box. 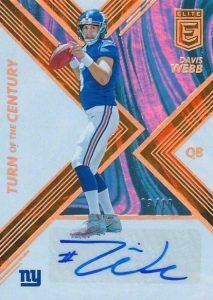 2017 Donruss Elite Football adds to that with different ink color versions. Other rookie-focused options include Turn of the Century Autograph inserts (#/149 or less) with a design similar to the base set. A hobby staple, Passing the Torch dual autographs pair two premier signatures on one card. There are also more autographed inserts to chase, like Back to the Future Signatures, Elite Signatures, Impact Impressions and Team Lineage. 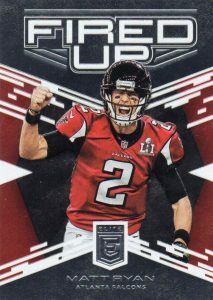 Rounding out the release, 2017 Donruss Elite Football promises one relic card per hobby box. 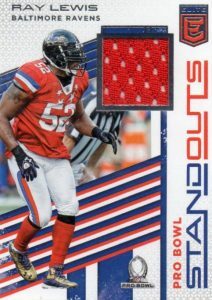 The memorabilia versions in play here include Elite Coverage, Epic Materials, Prime Numbers, Pro Bowl Standouts, and Throwback Threads, which showcases former players in Single (#/99 or less) or Dual form. 200 cards. Rookies - Serial numbered #/499. PARALLEL CARDS: Green (Walmart), Red #/149, Purple #/99, Status #/99 or less, Aspirations #/98 or less, Orange #/25, Aspirations Die-Cut #/24, Status Die-Cut #/24, Blue #/15, Gold 1/1. PARALLEL CARDS: Red #/99 or #/49, Purple #/25, Orange #/10, Blue #/5, Gold 1/1. 49 cards. Walmart only. Shop on eBay. PARALLEL CARDS: Red #/199 or less, Purple #/25, Orange #/10, Blue #/5, Gold 1/1. *Cam Robinson only in orange/blue/gold parallels; Jabrill Pepper only in Gold parallel. 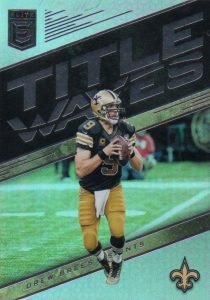 PARALLEL CARDS: Gold #/5, Black 1/1. 15 cards. Serial numbered #/299. Shop on eBay. PARALLEL CARDS: Green (Walmart), Red #/99, Purple #/49, Orange #/25, Blue #/5, Gold 1/1. 10 cards. Serial numbered #/299. Shop on eBay. 25 cards. Serial numbered #/299. Shop on eBay. PARALLEL CARDS: Green, Red #/99, Purple #/49, Orange #/25, Blue #/5, Gold 1/1. *Geno Atkins only in Black parallel. PARALLEL CARDS: Blue Ink, Green Ink, Red Ink. PARALLEL CARDS: Prime #/5 or less. 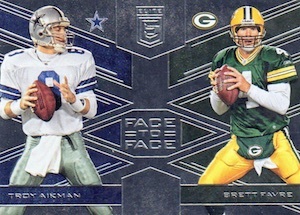 PARALLEL CARDS: Prime #/99 or less. 40 cards. Serial numbered #/299. Shop on eBay. Cards spell out last name with individual letters. Watched a few case breaks on Youtube to get an idea of what was being pulled. Checklist looked intriguing so I thought about buying a box. After watching the videos, I won’t be. The consistent hits, as usual, are no name players. The Pen Pals autographs are the worst. I can understand paying maybe $50 a box, but over $100? Absolutely crazy. Out of one case break I saw, the best card pulled was an Eddie Lacy (Packers) Jersey numbered to 99 or something. Pathetic. This set is garbage, the lack of patriots is disturbing since they just won the Super bowl, and not a single rookie could sign? Or maybe I missed it. I love the design. Purchased 3/4 of an open box at the local shop and pulled Fournette/Westbrook Pen Pal Duals in red ink. Is it pricy? Yes it is. Is it over priced? Not to me it isn’t. If you wan’t cheap then I suggest you go purchase a lower price point option. One of my favorite products of the year. Better get them now before the prices go up 50% like they did with last year’s product. Would be nice to know the run print of all the pen pal auto’s. Anyone know how to find that information? Webb: Panini normally provides ranges at some point but unlikely to ever know exact numbers. 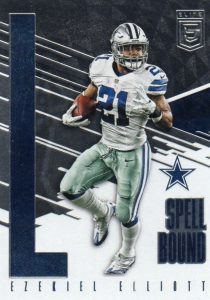 Liked Elite since it was Donruss. Your checklist for Team Lineage Signatures should be TLDC for the Cowboys instead of #1 and so forth for the rest. Excellent looking cards with good photos. Too many people expect to get super hits in every box. Collect for the enjoyment. If you want to gamble, go to a casino. Got 7 rookie cards, Prescott dual relic, triple Dallas Signatures and Darboh Penpals. Patrick here is my best guess on the Walmart Exclusives. I’ve gotten two for the heck of it, knowing full well I’d get relics and not autos even though it states you get one or the other. The first three “non fat” packs in a box yielded two green Parallels. One of a regular card, one of an insert card. Fat pack was a relic and a green Parallel insert. You get 7 green Parallels in box plus relic. My relics were Allen Robinson Pro Bowl Standouts & Sterling Shepard dual Elite Coverage. Little pricey at $29.99 though. So this will be a tough set to build I’d think. Hope that sheds some light buddy. I’m a bit confused as rookie cards and certain inserts should be #’d and mine weren’t due to them being green Parallels maybe?? Trey any word on this?? Matt/Patrick: Green is the one parallel for many options in the set, including the main rookies, where it is not numbered when everything else in that particular set is. So far, Green seems to be the main exclusive in the Walmart boxes. 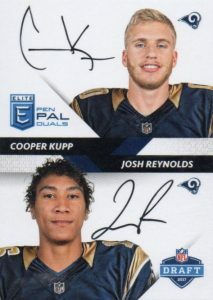 There are also Walmart exclusive rookie autographs with a horizontal design. 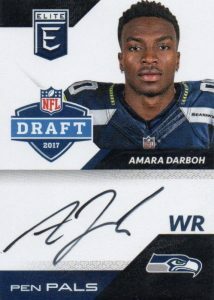 I pulled a Brandon Marshall Aspirations #’d/85 and can’t find the variation in the checklist. I’ve seen a couple floating around, but with little description. Do you have any information on these? Drew: To help consolidate the information, we list the parallels in one group at the top of the section. The Aspirations parallels take the player’s jersey number and subtract from 100 to get the print run. 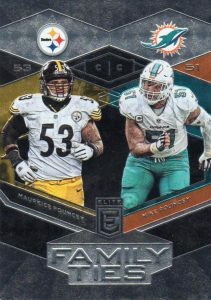 The Status parallel is limited to the actual jersey number, bringing the the overall total for those two parallels to 100 cards. 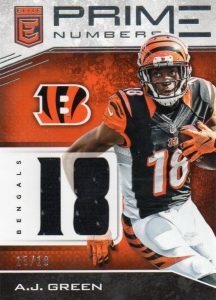 2017 Panini Donruss Elite Football Hobby Box - Factory Sealed!